The board, which operates under Iran’s Ministry of Culture and Islamic Guidance, also cautioned the influential ultra-hard-line Kayhan daily and the website Rajanews over some of their "headlines and content." Iran and the so-called P5+1 group of world powers -- Britain, China, France, Russia, and the United States, plus Germany -- reached an agreement in Vienna last month to lift sanctions against Tehran in exchange for significant curbs on its nuclear program. The deal has been welcomed by many Iranians but faced criticism from some hard-liners who accuse Tehran's negotiators of making too many concessions to the West and violating red lines set by Iranian Supreme Leader Ayatollah Ali Khamenei. "The news of the banning of 9 Dey under the government of [Iranian President Hassan] Rohani is not surprising," Rasaei wrote on Instagram in reaction to the suspension of his newspaper. He accused Rohani's government of having little tolerance for criticism and said that his publication has been targeted three times due to its "enlightening" coverage of the nuclear negotiations. The website said that "unlike the negotiating team," the outlets targeted by the media watchdog had respected Khamenei's red lines while offering a "technical review" of published texts and comments by negotiators. Rajanews added that if the nuclear deal were good for Iran, then there would be no need for "top-secret directives" and actions against the media to portray it as a victory. 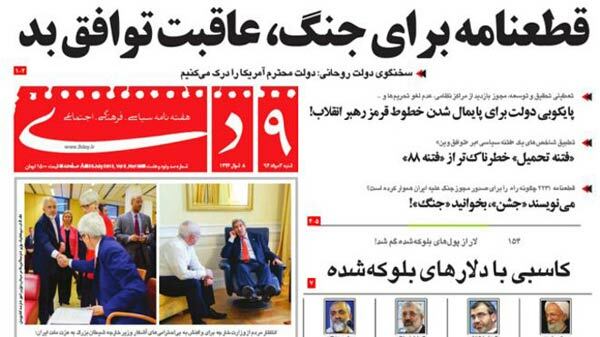 Kayhan has been critical of the talks and the accord. One of the daily's recent front-page headlines claimed that the Vienna agreement was a "shot" at Iran’s security. The guidelines, a purported copy of which surfaced on the Internet late last month, instructed editors of newspapers and news agencies to praise the deal and note "big achievements on the nuclear program as the result of the deal." It also said that media should avoid publishing content that suggests a "rift" among senior officials about the negotiations. The guidelines also said articles that create "doubts and disappointments" among the public should be avoided. While pro-reform publications have been regularly targeted by censors, attacks on the conservative media by Iran's ruling establishment have been less frequent.